Baltimore – Normally, a search and rescue call on the water is routed through a Coast Guard unit for coordination. No such call was made when a Coast Guard Auxiliary boat crew happened upon three kayakers in a busy shipping lane with a cargo ship minutes away from colliding with them the night of July 19. 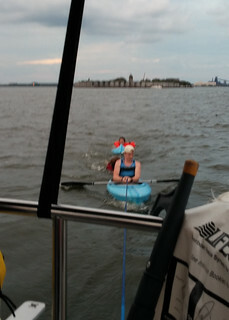 Three kayakers are towed out of Fort McHenry Channel July 19, 2014. The kayakers were in distress in a busy shipping channel. A local Coast Guard Auxiliary crew was underway conducting routine training and drills when a lookout spotted what appeared to be a single kayaker in the middle of the Fort McHenry Channel. Although sea conditions were calm, the sun was quickly setting and the kayaker was in the middle of a busy shipping channel with a large, cargo ship inbound.Three kayakers are towed out of Fort McHenry Channel July 19, 2014. The kayakers were in distress in a busy shipping channel. As the crew neared the kayaker, they discovered two additional people in the water. The kayakers had no radio, signaling devices or lights and only one of the men in the water was wearing a life jacket. The crew provided floatation devices for the two people in the water and threw a line to the only kayaker remaining afloat. The tow was initiated immediately to remove the kayakers from the ship’s path. Once out of immediate danger, the crew helped the two kayakers out of the water and began rendering first aid. They were treated for mild hypothermia.